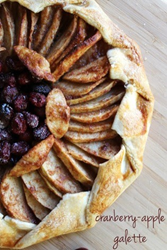 Laura Podlich of Madison, WI, was declared the $2,000 grand prize winner for her unique cranberry apple galette submission. Move over turkey and make room for some innovative, new cranberry creations! Hundreds of creative cranberry recipe and décor entries were received in the first-ever Cranberry Friendsgiving Photo Contest, but only one social media maven brought home the prize. Laura Podlich of Madison, WI, was declared the $2,000 grand prize winner for her unique cranberry apple galette submission. Cranberries have long had a place at mom’s Thanksgiving table, but as America’s Original Superfruit®, U.S.-grown cranberries are also a star at any Friendsgiving feast – a new millennial-driven trend of celebrating with close friends and family either on Thanksgiving or the weeks before or after. In honor of this new American holiday, the Cranberry Marketing Committee, USA (CMC) launched the 2015 Cranberry Friendsgiving Photo Contest inviting millennials to feature the versatility of cranberries during their Friendsgiving festivities. From October 26, 2015 through December 14, 2015, millennials were asked to share their cranberry creations on social media with the hashtag #FriendsgivingCranberryContest, and then submit their entries on CranberryFriendsgiving.com, for a chance to win the grand prize of $2,000 toward their next dinner party.